You have an existing site. But you’re not getting the traffic that you want. and to make matters worse, you aren’t converting enough of the traffic that you are getting. You’re ready to grow as a business, but you need a growth driven design in place to make the jump to the next level. 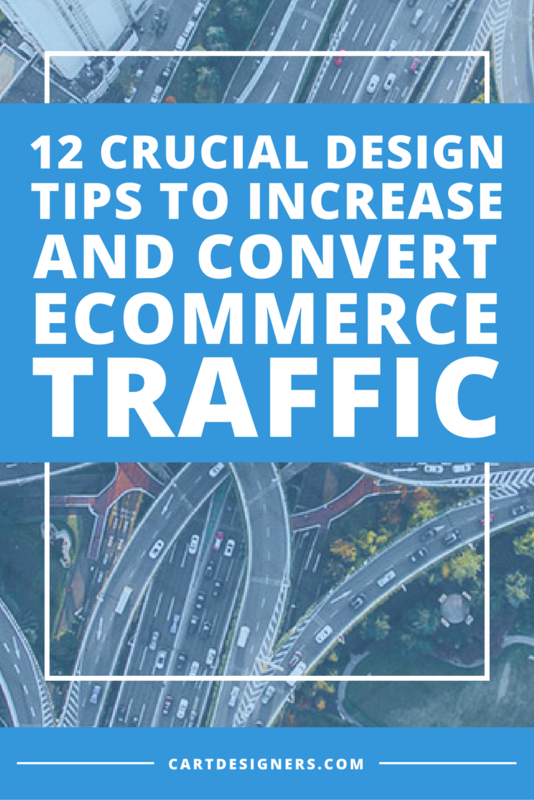 Here’s some important design tips to not only get more traffic, but ultimately convert ecommerce traffic with a website that works. SEO – Keywords still matter. However, Google recently announced that “exact match” keywords won’t be necessary anymore. This means if you’re trying to rank for “Best Dresses in Denver”, an article that was keyworded for “Denver’s Best Dresses” would rank equally. BUT, in order to rank well, you have to provide unique, quality content. This can be difficult, but proving yourself as an authority will pay off in the long run with the Google search engines. You should also make connections within your industry and it’s relevant communities. Whether it’s other sites, forums, journalists or aggregators, become an expert that share their expertise through answering questions or writing guest blogs. This will ultimately build inbound links, which in turn will bring more traffic and site authority. On your website, have premium content such as user guides, ebooks, or other types of quality explaining material. Social Media – Facebook, Twitter, Instagram and Pinterest have all integrated themselves into many people’s everyday lives. Offering exceptional and non-promoting content for your followers in the beginning will build a bigger and more attentive audience. You can then follow up this quality content with a passive self-promotion. The term “passive” is used to remind you to not overwhelm and ultimately scare off followers. Using fun, informative, and attention grabbing content greatly increases the likelihood of being shared. Don’t be afraid (in fact, it’s encouraged) to help and promote your followers too. Again, be mindful to not ask too many favors, but building relationships and reciprocating with your followers can benefit everyone involved. Also, remember to engage and follow people who are interacting with your competitors. They have expressed an interest in your product or service niche, so don’t be shy about talking to them. Mobile Optimize – This bears repeating ad nauseam for two reasons. One is, there are still websites online that don’t load to mobile devices quickly, correctly, or even at all in some of the most extreme cases. Secondly, almost 90% of the time someone is using their phone, they are on some form of social media app. When you include the fact that a huge percentage of online shopping is through smartphones now, the importance cannot be understated. Adwords/PPC – If you’re like many small businesses, certain adword campaigns are priced beyond your current means. Google’s Remarketing List gives you the opportunity to customize your ad campaign for previous site visitors. It also tailors your ads and bids to these particular visitors when they’re searching on Google or visiting other search partner sites. Competing with the big boys through PPC isn’t easy, but there are ways for you to make your mark without going head to head. One way you can do this is through “day parting”. This means you only run ads during certain time slots, such as when your staff is available to take calls or assist customers. Another approach is Geo-Targeting. This is placing your ads to particular geographic locations that would find relevance or need for your products or services. For example, offering suntan lotion in northern Canada isn’t likely to net much of a return. However, in Florida, those ads are far more likely to find success. Speed – Your website should have an instant load time, while also immediately responding to clicks. And of course, it should be mobile friendly. Clean Design – You should have a design that is easy to read, and simple to navigate and operate. Just like a restaurant must be clean to attract and retain customers for future and current sales, so too should your website. Relevant to the Traffic Source – If you’re running an ad for winter jackets, then your ad should point traffic to the winter jackets page, not your home page. Clear CTA (Call to Action) – If they’ve clicked through to your site, whether by an ad or a link, they have moved into the sales funnel. There is an expressed interest in your products or services. Therefore, it’s imperative that you have a large, clear, and effective CTA on the landing page. Site Search – This function should be easy to find, and work well. A visitor using your search bar shows they are more engaged as they type in their purchase intentions. A suggestion for better marketing is to review your site search once a month and query your top 20 most common searches for added analytic insight. Urgency – A sense of “Buy now, before it’s too late” has proven to be successful. Terms such as “limited time offer”, “low stock”, or the use of timers such as “20 minutes left before this offer expires” are tried and tested winners. The feeling that a decision needs to be made now instead of later increases the likelihood of a sale. Buttons – Buy Now, Add to Cart, or Get Started buttons are examples of what your buttons should say. Testing different phrases for the best audience engagement is encouraged. Speaking of testing, A/B testing is one of the best ways to determine which works best. When placing the button, contrast the color to stand out from other dominant site colors. Traditionally, these buttons are found under the thumb, in the bottom right quadrant of the screen. Engagement – The aforementioned A/B (or other user) testing allows you to track real time interaction from visitors to your site. You’ll be able to find stuck spots, hot spots, and other detailed information that falls perfectly in line with growth driven design concepts. Also, remember to use social media apps, as they are an invaluable source to increase engagement. If your goal is to grow your business through better design, and convert ecommerce traffic into actual customers, these tips are a great step in that direction. For additional insight on how to use data to increase conversions, check out 5 Proven Ways to Use Data to Improve Ecommerce Conversions. Are You Ready For an Award-Winning Website? Not Quite, How About More Samples? Copyright © 2019 Cart Designers, LLC. All Rights Reserved.